Glamorgan held out for a draw in a tense, rain-affected game against Gloucestershire after Will Gidman took the visitors to the brink of victory. Gidman took three early wickets as the hosts went into lunch just 32 runs ahead on 118-6. But rain held up play until 16:45 BST, leaving only 20 overs remaining. And although Gidman took 6-50, Glamorgan's final pair of Dean Cosker and Michael Hogan saw out the final eight overs as they ended on 148-9. Hogan made an unbeaten 19 and Cosker was four not out when Gloucestershire ran out of time after Gidman took all the wickets to fall on the final day. Murray Goodwin (32) made the only significant contribution for the Welsh county before he was bowled by Gidman, who later dismissed Graham Wagg and Ruaidhri Smith in successive balls. But neither he nor his team-mates could separate Cosker and Hogan and the game ended with Glamorgan only 50 ahead and relieved to escape. 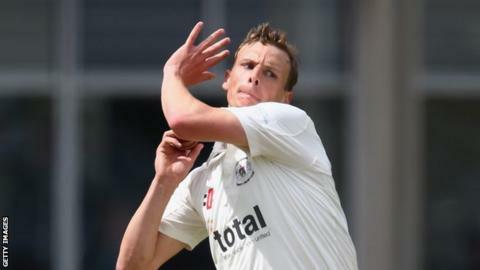 "The weather ultimately was the victor at Cardiff and also Glamorgan's saviour as Gloucestershire ran out of time to chase what would have been a relatively easy target. "Will Gidman again bowled superbly, and his captain Michael Klinger is looking forward to the battle with Essex next week, which he sees as an opportunity to put the all-rounder in the shop window when England captain Alistair Cook comes to Bristol with his county side."